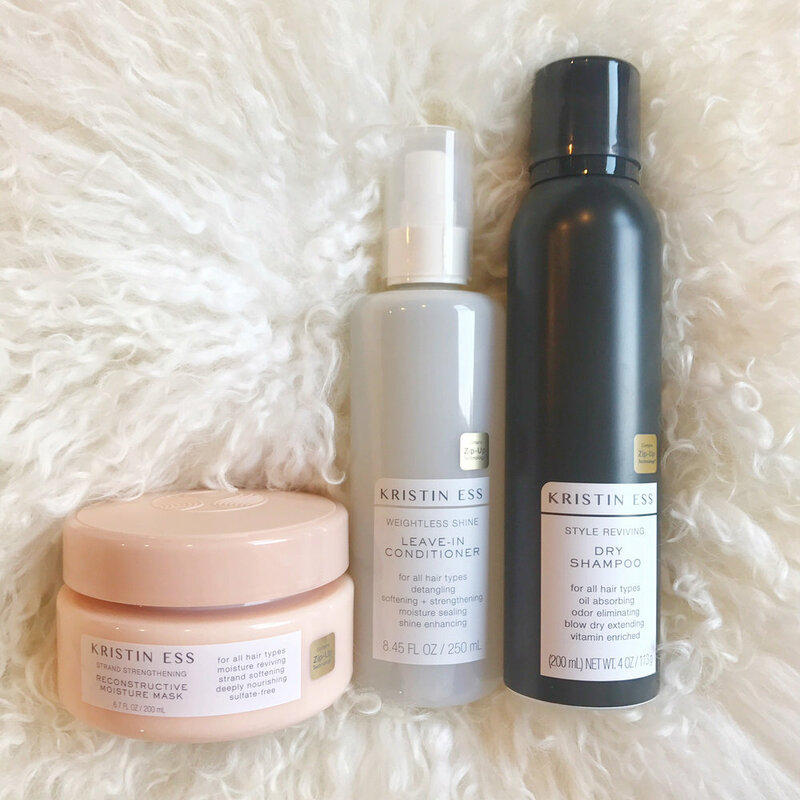 Kristin Ess hair care line has finally launched in Target! I was really excited about this launch because of the celebrity clientele stylist Kristin Ess keeps. If I can afford to have #hairgoals like Lauren Conrad and Lucy Hale (current clients of her), then I am sold. She launched four different lines of products; cleanse + condition, repair, wet styling, and dry styling + finishing. All products are either $10 or $14 dollars at Target, which I think is an amazing price point. I definitely do not like spending much on my hair products, so I was excited to give these a go. I decided to get three products from three different lines. I have colored my hair blonde since high school, so with that I have very dry, weak strands. I normally get a little apprehensive with deep conditioners/masks because I have very fine hair that is easily weighed down. After shampooing my hair with Paul Mitchell's Forever Blonde, I applied this to my lower half of my hair. The directions are to leave it on for 5 minutes or longer and I definitely left it on longer. If I am going to take the time to put a hair mask it, I am going to use that time to multi-task and shave properly (exfoliate+cleanse+shave evenly). After about 7-8 minutes, I rinsed it throughly using a wide-toothed comb. All the knots came easily undone and my hair felt very silky. When I first saw this on Target's shelf, I was very impressed by the packaging. Very sleek, minimalist, and something that looks great displayed in the shower. The design adorned on the packaging is very luxury looking. It reminded me of the seal on the front of every Oribe product. The texture is more of a cream-lotion. It didn't feel heavy or leave a residue on my hair after rinsing. My hair felt smooth (which may be the dimethicone), but it was nice any way. The scent at first was very chemically, almost harsh. The scent went away after it sat on my hair...thankfully. The nice dissipated scent ended up lingering on my hair and reminded me of the Dry Bar line of hair styling products. Floraly, with a touch of musk. I think it's great how much product you get AND that you can see when you are running low. It's the little things. The cap has the brand design. The actual 'sprayer' component is very basic, which is neither good or bad. This clear liquid is very water-like. Which to me means WEIGHTLESS, my preference for sure. The scent is a subtle version of the Reconstructive Moisture Mask. To me this is a very simple, no brainer product that I think a lot of hair types would like. My hair drank this stuff up and did not leave any build-up. I have very oily roots normally and have a hard time finding a dry shampoo that absorbs oil for multiple days in a row. I brushed my dry hair again with my Wet Brush and sprayed this all along the crown and part of my hair. It left my hair feeling clean, however, it did not last all day. My hair looked greasy about half way into the day...sad. I think I still prefer my trusty Batiste Dry Shampoo, Strength and Shine. Very typical dry shampoo packaging, with a beautiful aerosol delivery system. This allowed the product to distribute evenly and not leave any area with too much product. The best part of this product is that it does not leave ANY white cast on your hair. I would recommend this to someone with not so oily roots and who has brown/black hair. Another great call out is their is no grit or texture. I know that everyone likes a more textured style nowadays and too many dry shampoos now are hybrid texturizers. This is purely a dry shampoo. The scent is along the same line as the other two products, again very similar to Dry Bar styling products. I will definitely try more products out from Kristin Ess. I hope you found my review helpful! #hairgoals are now within reach.